Peanut butter lover? Put this on your drink list. DuClaw For Pete’s Sake is back in action as of today. The brewery has two peanut butter infused beers. This all got started with Sweet Baby Jesus!, a 6.2% alcohol by volume porter, brewed with chocolate and peanut butter. That beer was/is an instant classic. Why stop there, when you can make the beer stronger. That’s where DuClaw For Pete’s Sake came to be – an imperial chocolate peanut butter porter. Everything about this beer is rich. A mouthful of chocolate and peanut butter, with a warming 9% ABV finish. DuClaw For Pete’s Sake is the last seasonal release by the brewery in 2016. Available in 12 ounce bottles and draft. Terrapin Liquid Lunch Peanut Butter Jelly Porter is the brewery’s Side Project #25. The Athens, Georgia based brewery shipped this new offering this week. Taking a page from another peanut butter offering, Liquid Bliss, the brewing team has made your favorite lunch as a kid, boozy. We are assuming the crusts are cut off. We’re talking raspberries here people. Cut off the crust and unwrap the flavor of this fruit centric beer. Hand crafted using real raspberries, “Liquid Lunch” Peanut Butter Jelly Porter combines all the elements of a familiar lunch time snack. 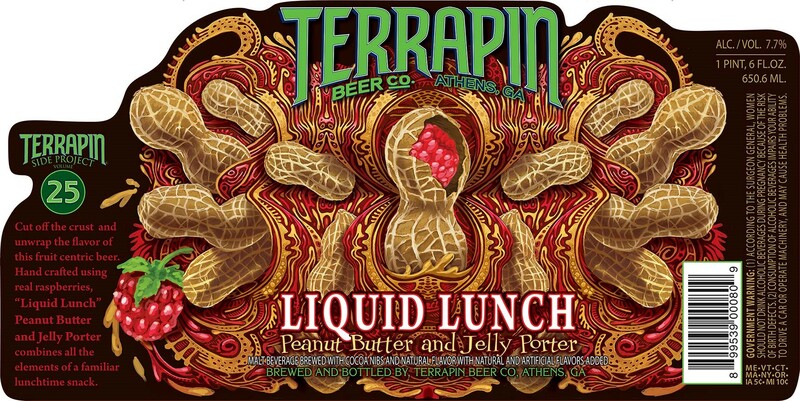 Terrapin Liquid Lunch is now available in 22oz bottles.